We rely on customers to provide a clear brief of their artwork requirements when ordering promotional merchandise items from us. "We can accept artwork in a range of formats including editable (vector file) EPS, PDF, Illustrator and PhotoShop formats with all fonts converted to outlines/paths." We do not use Corel Draw or Freehand but can usually get these converted. Unfortunately, artwork generated in non-graphic design packages (such as Microsoft Word, Works or Publisher) will not usually be of a sufficiently high quality for us to print from. For example a scanned in business card or letterhead is, unfortunately, not sufficient for use to use as finished artwork. The most common reason for rejecting artwork is that it is of too low a resolution. This means that it will appear ‘grainy’ with rough edges when reproduced on promotional items. We generally need artwork at a resolution of 300dpi. Images that have been downloaded from websites are not of a high enough resolution. Sometimes we have to recreate artwork that you send us, as it is not of a high enough quality to use as a basis for printing. If we do have to do this then we will work with you to help you provide higher quality artwork. This may mean going back to your own graphic designer or brand manager, or it may mean that we have to re-draw the artwork for you. If we have to spend time re-drawing artwork then we will normally charge for this. Please see full details of out artwork charges for more information. In our experience, fonts that are clear and easy to read reproduce best on promotional items. Intricate fonts and very small font sizes can sometimes reproduce poorly as the ink ’bleeds’ when printed and fills in some of the white areas in the individual letters. The number of colours printed on an item can also sometimes cause confusion. We normally print either in spot colours (of which there may be several on one item) or in full colour (also known as four colour process). Spot colours are usually defined by their Pantone reference (for example, 289 which is dark blue). Full colour printing involves defining every individual colour using different percentages of the four primary print colours Cyan, Magenta, Yellow and Black (commonly known as CMYK). If you do not know what colour your logo is, please click here to see our handy guide of pantone colours. Printed colours can look different depending on the colour of the product that is being printed on and it is not always possible to get an exact colour match. 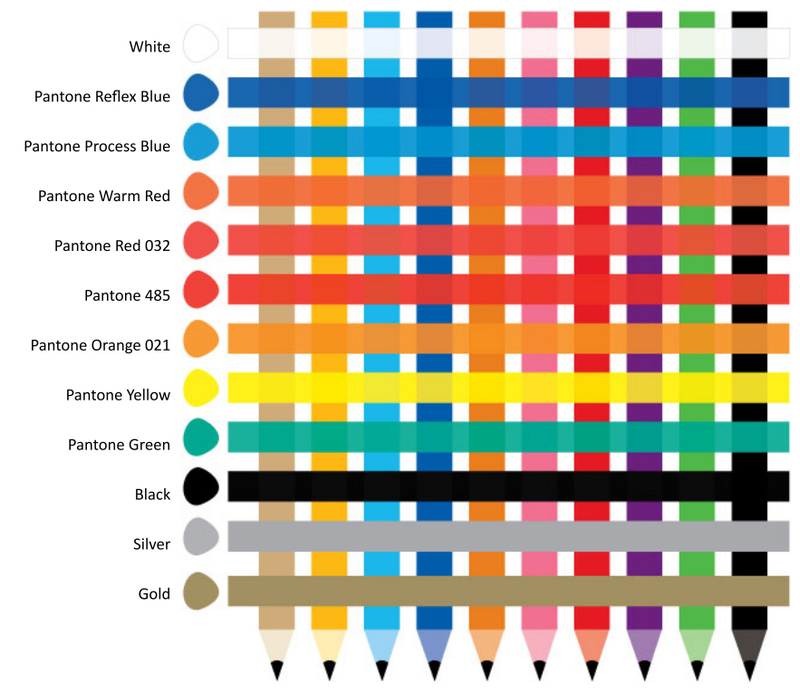 To assist with colour choices, view our colour matching chart below to see how some standard Pantone colours may reproduce when printed on different colour products. As you can see, the background colour can influence the final print colour and this should be taken into consideration when selecting a print colour. Some items can only be printed in spot colour and some only in full colour. If this applies to an item that you’re interested in then we will advise you when you make your initial enquiry. If you have your own graphic designer or brand manager then they will often have access to versions of your logo in different colours – one, two and full colour. Alternatively, we may be able to convert your logo to a one or two colour version. Please note that any colours shown on a computer monitor may not be exactly the same as they appear on the final printed items. This is because the colours are reproduced using two different methods: the screen displays colours according to transmitted light using RGB (red, green, blue), whereas the printing displays colours according to the absorption and reflection of light of CMYK (cyan, magenta, yellow and black) colours. Origination is the set up of the equipment for the job – to produce the screen in the screen-printing process or to produce the disk for embroidery, for example. Origination is an industry-standard charge. The amount of the origination charge varies depending on what process is being used to print your chosen product. On some items there will not be an origination charge as they are printed digitally. If you place a repeat order for an identical item with an identical print then you will not usually be charged a second origination as it should be possible to use the original setup. All items we produce for you are subject to a signed-off artwork proof. This is a final chance to spot any errors before we print. Please make sure you always carefully check the proof and, if in doubt, ask questions because, once printed, it is extremely rare that errors can be corrected or changes made without incurring further charges. Artwork proofs are usually sent by email via our online proofing system. Once you have received and checked the proof you need to approve the proof so that we can proceed further. If you do not have a print-ready design then we can help create one. However, we do ask you to provide us with a detailed brief, as we cannot know your logo, colours and ‘house-style’ as well as you do. Please provide us with as much information as possible at the start of the process. We normally charge for design work, as any other graphic design agency would. We want you to be happy with your promotional items and we appreciate that, sometimes, minor amendments are needed to a design before the final go-ahead can be given. In recognition of this, our pricing allows for one or two minor amendments and re-proofing. Minor amendments include things such as changing a word, punctuation mark or colour. However, further substantial changes to a design (such as changing fonts, photos, graphics, large amounts of text, etc) will incur additional charges at the prevailing hourly rate. If you request an amendment that is likely to incur an additional design charge then you will be advised of this before we proceed with the work. All artwork generated becomes the property of the client (and can be supplied to them for later use) on settlement of all outstanding invoices relating to the artwork. If you have any questions about artwork, or there is something you do not understand, please contact us. Our design staff are very experienced and can usually provide advice on most things design-related.